In 2012, as an uninvited guest, Ben Parry spent extended periods in Mumbai as researcher and artist. 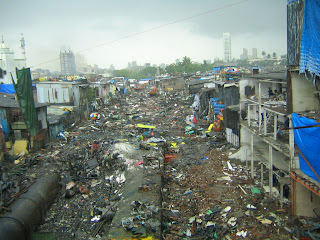 Based in the Dharavi slum, and working with community members, the Acorn Foundation and other NGOs, Ben has been interrogating his own outsider ‘gaze’ and that of others who come to investigate, intervene and ultimately extract knowledge about Mumbai’s informal or unofficial urban practices. Ben will be discussing Reversing the Gaze: a project which investigates the displacement of 450 families formerly living on the pipeline in Dharavi’s recycling district, known as the 13th Compound. The pipeline is one of the most documented and recognised images of ‘slum world’, made famous through its depiction in Slumdog Millionaire and National Geographic magazine. An over-productive global interest in Dharavi has even spawned an industry in slum tours. Last year, many of the residents of the 13th Compound disappeared without trace: they were the first residents to be evicted without entitlement to local rehousing through Dharavi’s Slum Redevelopment Schemes. The destruction of homes and livelihoods in aggressive land reclamation went largely unreported in the press. Ben Parry is a visual artist based in London. He received his BA at Glasgow School of Art and holds a Masters in Urban Planning from University of Liverpool. He co-directs arts organisation Jump Ship Rat through which he curates and produces exhibitions, site-specific projects and unsanctioned interventions in the public realm. He is undertaking a practice-led PhD in the School of Creative and Cultural Industries at the University of the West of Scotland. His work explores tactical and informal urbanism; appropriations and interim uses of voids and liminal spaces. He is co-editor of the book Cultural Hijack: rethinking intervention (2012 Liverpool University Press) an anthology of experimental approaches to situation-led urban interventions. To book tickets, please visit the CCA website.